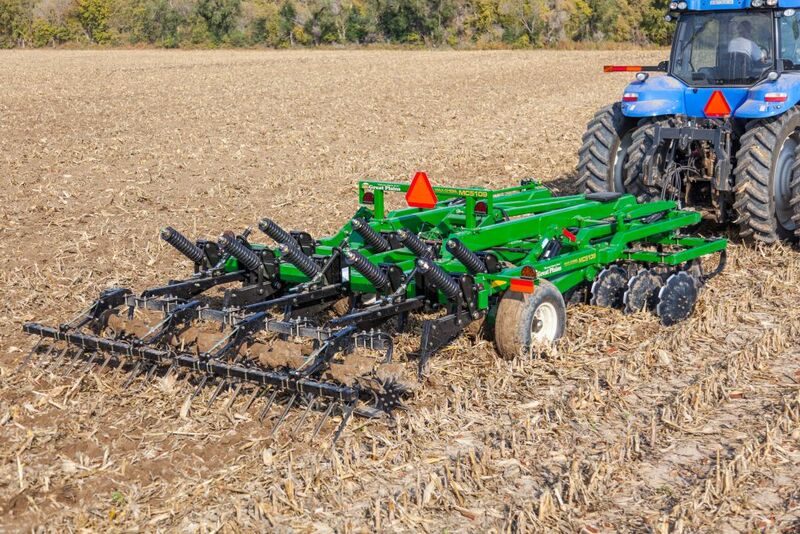 The Great Plains Max-Chisel is an aggressive primary tillage tool that works at a shallower depth and leaves fields smoother and more uniform than most traditional disk rippers. Built on the same rugged platform as the Great Plains Turbo-Chisel®, the Max-Chisel utilises two opposing rows of exclusive concave turbo-wave blades. 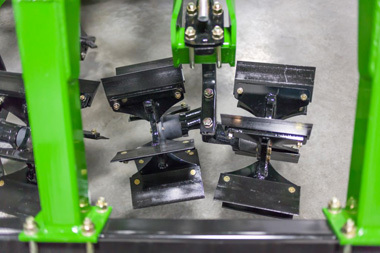 With a patented “samurai edge,” the blades aggressively remove root balls while mixing and incorporating residue in the top 4″ to 5″ (10cm to 13cm) of soil, chopping it to accelerate the decaying process. Mounted to individual C-shanks, 24″ (61cm) blades on 15″ (38cm) spacing allow plenty of trash clearance. 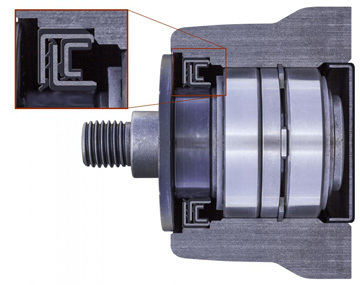 All feature maintenance-free tapered bearings in a cast hub and a six-lip interlocking seal to keep grease in and dirt out. 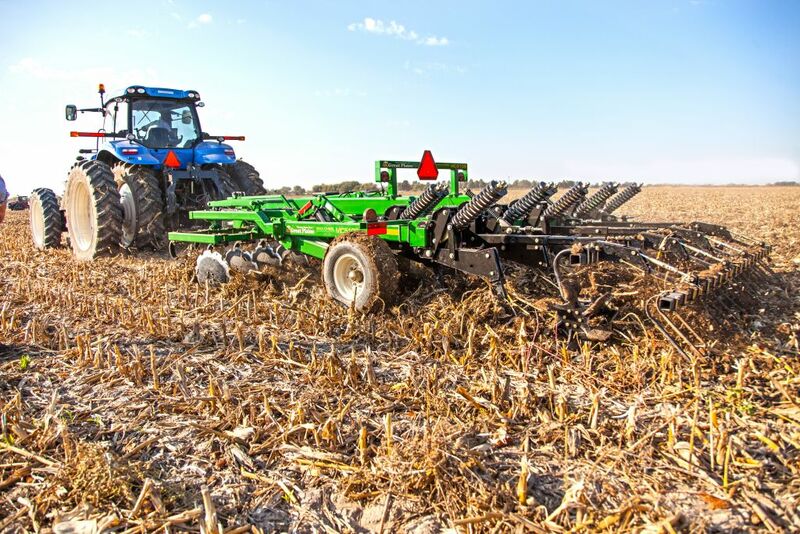 Max-Chisel works the soil more aggressively than a traditional chisel, but leaves the surface level enough for a single-pass tool, same as the Turbo-Max®, to finish the field ahead of the planter in the spring. 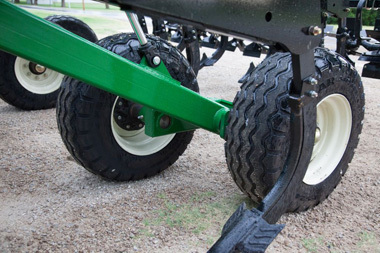 Angled chopper wheels combine with 15″ (38cm) shank spacing to pull dirt back into the shank voids, levelling the soil while maintaining the vertically-tilled profile left by the shanks. Max-Chisel is available in two rigid models, ranging from 11′ 6″ to 14′ (3.51m to 4.27m), and two folding versions of 16′ 6″ and 19′ (5.03m and 5.79m) . 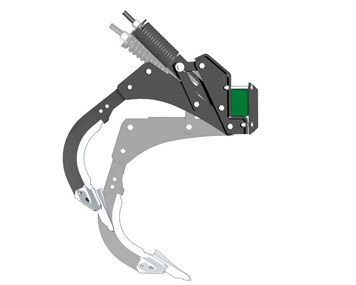 All feature hydraulically-adjustable disc gang depth control and heavy-duty toggle-trip reset shanks that can till up to 12″(30.5cm) deep. With 2,450 pounds (1,111kg) of horizontal trip force, these shanks will not pull out of hard ground like a traditional chisel. Medium-duty chisel shanks are also available. The disc gangs are hydraulically adjustable for on-the-go depth control, offering the flexibility to till up to 4″ (10cm) deep. All blades feature maintenance-free tapered bearings in a cast hub with six-lip interlocking seals to keep grease in and dirt out. Individual mounts offer more space between the 24″ (61cm) turbo discs. Features an exclusive turbo blade with a Samurai edge for excellent trash flow and better performance in wet conditions. 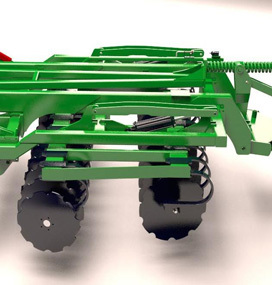 When equipped with heavy-duty toggle-trip shanks, this “hybrid” unit works in the 8″ to 12″ (20.5cm to 30.5cm) range (rather than the 13″ to 15″ (33cm to 38cm) range required by disk rippers) while horizontally fracturing soil much better than a disk chisel. Toggle-trip shanks can’t float. They either run at the set depth or trip – there is no inbetween. EXCLUSIVE CONCAVE TURBO-WAVE BLADES WITH PATENTED ?SAMURAI EDGE? 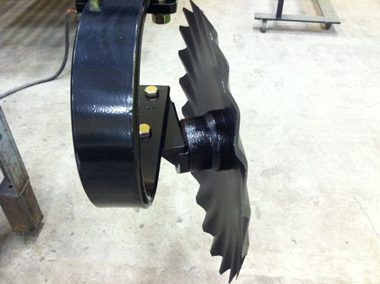 Mounted to individual C-shanks, 24″ (61cm) blades on 15″ (38cm) spacing allow plenty of trash clearance. 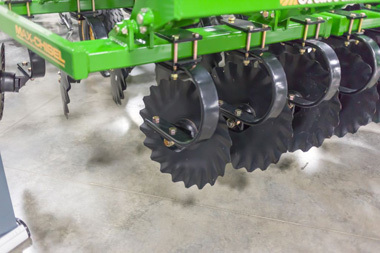 Two opposing rows of exclusive concave turbo-wave blades aggressively remove root balls while mixing and incorporating residue in the top 4″ to 5″ (10cm to 13cm) of soil, pinning it to the ground to accelerate the decaying process. 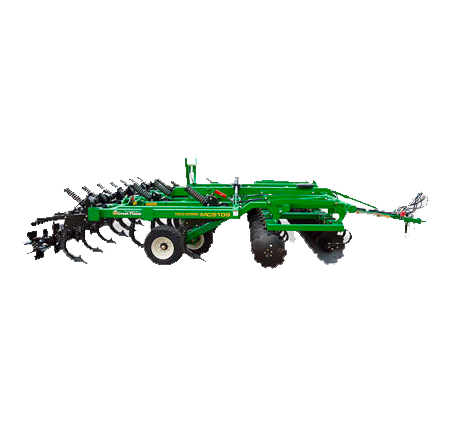 Angled chopper wheels and 15″ (38cm) shank spacing work together to pull dirt back into shank voids, levelling soil while maintaining the vertically-tilled profile left by the shanks. Standard.